Coaching changes have been fast and furious over the past few weeks as four NHL bench bosses have lost their jobs and we’re just at the quarter mark of the season. The Los Angeles Kings got the ball rolling when Willie Desjardins was brought in to take over from John Stevens and the Chicago Blackhawks quickly followed up by sacking Joel Quenneville in favor of Jeremy Colliton. They’ve now been joined on the unemployment line by Mike Yeo, formerly of the St. Louis Blues and former Edmonton Oilers taskmaster Todd McLellan. Yeo was let go on November 19th and McLellan was relieved of his duties the next day. The 45-year-old Yeo entered the coaching ranks after a knee injury ended his minor-league playing days. He found himself as an assistant coach with the Pittsburgh Penguins in 2005 and left five years later to take over the Houston Aeros of the AHL, who were affiliated with the Minnesota Wild. He led the Aeros to the Conference Championship and Minnesota rewarded him by hiring him as their new head coach in June, 2011. Yeo missed the playoffs in his first year with the Wild, but reached them the next three seasons while being eliminated in the first, second, and second rounds. He lost his job in 2015/16 with a record of 23-22-10 after 55 games in February after his team had lost 13 of their last 14 games. His numbers with the Wild weren’t bad as Yeo went 173-132-44 in 349 regular-season games, but was just 11-17 in the postseason. He wasn’t out of work long though as the Blues hired him four months later as an assistant to head coach Ken Hitchcock. He was brought in to take over from Hitchcock the next season as Hitchcock announced he would be retiring. He didn’t get the chance to quit though as Yeo was promoted to head coach in February, 2017 when Hitchcock was fired. Yeo and the Blues caught fire after that and went 22-8-2 over the remainder of the season before ousting Minnesota in the playoffs. They didn’t go any further though as Nashville knocked them out in the second round. The Blues posted 94 points the next season, but missed the playoffs by a single point. Yeo was let go this November while the Blues were 7-9-3 and languishing in seventh and last place in the Central Division with 17 points from 19 games. The firing was announced shortly after St. Louis was shutout 2-0 on home ice by the Los Angeles Kings, who were sitting in the league basement. It was the third time the Blues had been shutout in their last four games. General manager Doug Armstrong announced that assistant coach Craig Berube would be taking over behind the bench in the interim and Yeo leaves his post with a 73-29-11 record in St. Louis. The 52-year-old Berube has been with the Blues since 2017 and has head coaching experience with the Philadelphia Phantoms and Chicago Wolves of the AHL. He also coached 161 games with the Philadelphia Flyers from 2013 to 2015 going 75-58-28. He lost in the first round of the playoffs in 2013/14 and missed them the next year. Berube played for 17 years in the NHL and finished his career in seventh place on the all-time penalty list by serving 3,149 minutes in the sin bin, so we may see the Blues play a more aggressive style now. While there’s still time for St. Louis to turn things around and make the postseason, team management wasn’t happy with the increasing number of empty seats in their home rink during games. Armstrong feels the club needs to climb the standings and enter the playoff race to attract fans the rest of the way. The team was expected to return to the playoffs this year after acquiring some formidable players during the offseason such as forwards Ryan O’Reilly, Patrick Maroon, David Perron and Tyler Bozak. 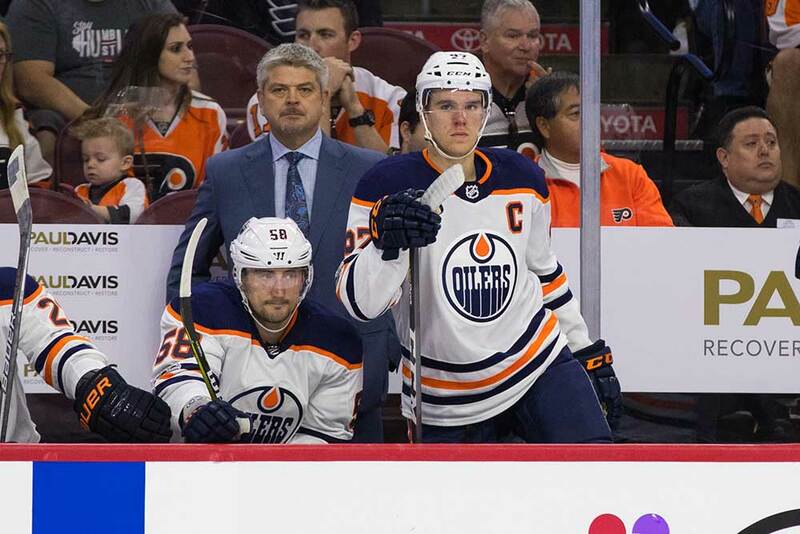 Meanwhile out in Edmonton, the 51-year-old McLellan was sent packing while the Oilers had a 9-10-1 record and owned sixth place in the eight-team Pacific Division. They had lost their last two games and six of their past seven. His job has been taken over by the same Ken Hitchcock who was fired by St. Louis when Yeo took over. McLellan coached the San Jose Sharks for seven seasons before the Oilers hired him as head coach in 2015/16. He also worked as an assistant coach with the Detroit Red Wings before his stint in San Jose and won a Stanley Cup in the Motor City in 2007/08. McLellan missed the playoffs in his first year in Edmonton as well as last season and was eliminated in the second round by the Anaheim Ducks in 2016/17. McLellan went 123-119-24 with Edmonton and his career coaching record stands at 434-282-90 with a 37-38 mark in the postseason. The hiring of Hitchcock is a little surprising since the 66-year-old was retired and Quenneville is reportedly interested in working again after being dismissed by Chicago. In addition, one of the reasons McLellan was let go was because the Oilers have several offensively-gifted players in the lineup including Connor McDavid, Leon Draisaitl and Ryan Nugent-Hopkins and they still have trouble winning. But now they’re bringing in a coach who’s well known for his defensive tactics. Hitchcock, who happens to be a native of Edmonton, was the head coach of the Dallas Stars last season before retiring. He has also coached the Blues, Flyers, and Columbus Blue Jackets. Hitchcock is ranked third in NHL history in coaching wins at 823 and has an all-time regular-season record of 823-506-88-119. He’s gone 86-82 in the playoffs and won the Stanley Cup with the Stars in 1998/99. Hitchcock has won eight divisional titles in his 21-season NHL career and has made the playoffs in 14 of those campaigns. He was the NHL coach of the year for 2011/12 in St. Louis and won a pair of Presidents’ Trophies with Dallas from 1997 to 1999 as the top regular-season team. Many fans will feel McLellan got the shaft here and it should have been general manager Peter Chiarelli getting the boot in Edmonton. It is what it is though and the firing of four coaches so far this season comes after no head coaches lost their job last year. That was a bit of an anomaly however as it was the first NHL campaign since 1966/67 that a head coach didn’t lose his job.